If you looking for pulmonary embolism practice questions then this study guide is for you. As you’ll see, we’ve listed out a ton of practice questions that will teach you everything you need to know about the disease and some of the important nuances to look for in the treatment and prevention of a pulmonary embolism. If you learn the information below, you will definitely put yourself in a great position to ace your exams in Respiratory Therapy school, pass the board exams, and become a great Respiratory Therapist when that time comes. Let’s get started! 1. What is a pulmonary embolism? It is a cardiopulmonary condition where one or more arteries in the lungs become blocked by a blood clot. 2. In respiratory therapy school, in general, what does PE stand for? 3. What are the most common emboli? Thrombi from femoral veins (DVTs). 4. Apart from thrombi, what else can embolize into the pulmonary arteries? Tumors, fat from bone fractures, amniotic fluid, and foreign material (from IV drug use). 5. What factors can cause alterations in blood flow, increasing the risk of deep vein thrombosis? Immobilization (surgery, injury or pregnancy), obesity, and cancer. 6. What factors can increase coagulability of the blood? Genetic thrombophilia, antiphospholipid syndrome, nephrotic syndrome and cancer. 7. What is the name of the score for predicting PE? 8. What happens in the lung after a PE blocks the pulmonary artery? Lung tissue is ventilated but not perfused. The non-perfused area stops producing surfactant so its alveoli collapse. Alveoli collapse exacerbates hypoxia. 9. What can happen to the heart in a pulmonary embolism and why? It can undergo ischemia, systemic hypoxia, and reduced accessible pulmonary circulation causes an increase in pulmonary artery pressure and thus reduced cardiac output. 10. What is the difference between a small or medium PE and a massive PE? Small or medium PEs affect a terminal pulmonary vessel while a massive PE affects a large pulmonary vessel, even the pulmonary artery itself. 11. What are symptoms of a small or medium PE? Dyspnea, tachypnea, pleuritic chest pain, cough, and hemoptysis. 12. What are the symptoms of a massive PE? Severe central chest pain, shock, paleness and sweating, cyanosis, collapse, circulatory instability and sudden death. 13. How can a pulmonary embolism be investigated? Chest x-ray (often normal), ECG, blood tests and ABG. 14. How is a pulmonary embolism managed? High flow oxygen, analgesia, IV fluid and fibrinolytic therapy with IV streptokinase. 15. How can a pulmonary embolism be prevented in at-risk patients? Anticoagulation (heparin then warfarin), compression stockings and inferior vena cava filter. Ambulation or activity to prevent the blood clotting or venous compression-occluded vessel and released vasoconstrictors cause an increased pressure for the right heart to work against; acutely it will dilate and then poop out. 16. What are the causes of a pulmonary embolism? Dehydration, venous stasis from prolonged immobility or surgery, or birth control pills. Also clotting disorders or heart arrhythmias like AFib. 17. Where do 95% of pulmonary emboli come from? Come from veins in legs. 18. What does increased pressure in lungs cause? 19. What are the signs and symptoms of pulmonary embolism? Hypoxemia is number one. PaO2 decreases, short of breath, tachypnea, tachycardia, chest pain, cough, and increased respiratory rate, increased D-dimer which increases with embolus, positive VQ scan, accentuated second heart sound, fever (infarct), positive spiral CT or CT angiography, hemoptysis, pulse increases, chest pain, sharp, stabbing, chest x-ray show atelectasis and BP in lungs goes up. 20. What does an increased D-dimer tell? It will tell if a clot located anywhere in the body, not just in the lungs. If embolism suspected post-op, D-dimer not recommended and better to do positive VQ scan. 21. What is a VQ scan? A ventilation/perfusion scan that can detect an embolus; done in radiology. 22. What does a VQ scan look at? Looks at blood flow to the lungs. Dye not used. Remove jewelry from chest area so that it will not give false results. 23. When may a CT or CT angiography be needed in order to diagnose pulmonary embolism? If inconclusive VQ scan or D-dimer cannot be used. 25. Why does pulse increase with pulmonary embolism? 26. What is the treatment for pulmonary embolism? Always prevent by ambulating and hydrating the patient, also SCDs and isometric exercises. Then oxygen, ABGs, decrease pain, anticoagulant therapy, bleeding precautions, and surgery. Bedrest, elevate extremities, TED hose, and warm moist heat. 27. What promotes clotting in veins? Virchow’s triad: stasis, hypercoagulability and venous injury. 28. What is reflected in end-tidal CO2 in a healthy lung? PaCO2. It cannot be done with increased deadspace. If this end-tidal CO2 is lower than the paCO2, this shows that there is increased deadspace. 29. Why does a pulmonary embolism lead to hypoxemia? Blood that cannot get to alveoli due to occlusion must go somewhere else, this increases the perfusion in the new area and makes a low VQ mismatch which is shunting that lowers O2 content. 30. How do emboli prevent gas exchange? They block circulation to certain parts of the lung causing no gas exchange there. 31. Where do clots form? In leg veins where the blood pools, and at the bottom of the lungs. 32. How does a venous thrombus form? Part of the clot (thrombus) breaks off (embolus) and enters circulation. 33. What are the risk factors for pulmonary embolism? Venous blood stasis, increased coagulation and damage to the vessel wall. 34. What are other types of thrombi (other than venous)? Air embolus, fat embolus, septic embolus, and tumor. 35. What is the pathophysiology of pulmonary emboli? Occlusion of blood flow to lungs causes ventilation-perfusion ration to mismatch, therefore, increases physiological dead space. 36. Why do clots tend to form at the bottom of the lung? Because there is decreased perfusion there. 37. What causes an increase in ventilation? An increase in dead space. 38. Why is HB saturation maximal? Because well-perfused areas cannot fully compensate for poorly perfused so PO2 does not improve. 39. What does occlusion of blood flow lead to? Increased pulmonary vascular resistance, which causes the redistribution of blood flow and pulmonary shunting and blood returns to systemic circulation with inadequate O2. 40. What can a large embolus lead to? Hemodynamic collapse causing decreased cardiac output. 41. What is the treatment of acute pulmonary embolism? IV heparin to prolong clotting time, this target thrombin which normally converts fibrinogen to fibrin. 42. What is the treatment of long-term pulmonary embolism? Warfarin (effects prothromin) or NOACs. 43. What are the EKG findings for a possible pulmonary embolism? Tachycardia, right axis deviation, inverted T waves, and right bundle branch block. 44. What are the consequences of a pulmonary embolism? Right-sided heart strain, complete resolution, infarct, recurrent emboli (pulmonary hypertension because of the chronic strain on the heart), and death. 45. When should contrast not be used during a CT angiogram? 46. What should be observed if CT angiogram cannot be used and you suspect a PE? See if you can find evidence in the legs. Note that they will be in deep veins and double note that the superficial femoral vein is a deep vein (also popliteal and iliac). 47. What can be noted in D-Dimer? It shows increased thrombolytic activity in the body. This test is often done in the ER and may show lots of false positives but helpful if negative. 48. What are the medications for a pulmonary embolism? Even if unsure, start treatment as long as no contraindications. These include heparin, synthetic pentasaccharide, coumadin (warfarin which is long acting), coumadin without heparin initially increases hypercoagulability and thrombolytics that is only used locally. 49. What is the prophylaxis of a pulmonary embolism? Patients at higher risk should be treated prophylactically especially after surgery. However do not give brain surgery patients heparin because a brain bleed would be terrible as they stuck with compression devices. 50. When can a ventilation-perfusion scans be diagnostically helpful? If they reveal a normal perfusion or greater than or equal to 2 perfusion defects in areas with normal ventilation. 51. What condition is CT angiogram not helpful? 52. What are the strong risk factors for pulmonary embolism? Fracture to a lower limb, hospitalization with AF or heart failure, THR, major trauma, myocardial infarction in the past 3 months and previous DVT. 53. What are the moderate risk factors for a pulmonary embolism? Autoimmune disease, blood transfusion, paralytic stroke, and infection. 54. What scoring system is used to determine the likelihood of a PE? Wells score (also one for DVT). 55. What would be the typical presentation of a massive PE? A patient presents with sudden severe chest pain, shortness of breath and syncope. They are hypertensive with raised JVP and have S1Q3T3 pattern on ECG. 56. What are the initial tests done in a suspected PE? Chest x-ray, ECG, and ABG, they are generally useful at ruling out the alternate cause. D-dimer is good negative predictive value but very non-specific and is only used if low wells score if high wells score due to immediate CT pulmonary angiogram. 57. What is the best test for diagnosing a pulmonary embolism? CTPA is the gold standard for diagnosing a PE. 58. What additional tests may be done after a pulmonary embolism diagnosis for prognostic purposes? Echo looking for RV dysfunction and troponin looking for signs of cardiac damage both associated with a higher risk for early mortality. 59. What factors suggest that a more severe PE is present? The patient is over 80-years-old, they had previous cancer, CHF, chronic pulmonary disease, systolic BP <100 and oxygen saturation <90%. 60. What is an alternative approach to treating a PE that does not involve regular blood testing? Immediately start apixaban or rivaroxaban and stay on them long term. 61. When might a CT scan be contraindicated? The patient is allergic to the contrast media, or with severe renal impairment, also pregnancy. 62. For how long should warfarin be continued after a PE? At least 3 months then reassess if there is a need for continued use. 63. What investigations are done in a patient with an unprovoked PE? Investigation of cancer, chest x-ray, routine blood work, and urinalysis. 64. What is a thrombus? A blood clot that forms and remains in a vein. 65. What is the definition of an embolus? A blood clot that becomes dislodged and travels to another part of the body. 66. What is a pulmonary infarction? When tissue of the lung dies. 67. Where do most pulmonary blood clots originate? 68. Besides clots, what are some possible causes of a pulmonary embolism? Fat, air, amniotic fluid, bone marrow, and tumor fragments. 69. What are three things that can cause a blood clot formation? Increased tendency of blood to form clots, injury to the endothelial cells that line the vessels and slowing or stagnation of blood flow through the veins. 70. What term describes the increased tendency of blood to form clots? 71. What clotting factors of the blood might increase and cause a clot? 72. What is a natural anticoagulant that may cause clotting if it is deficient? 73. How does the slowing of blood flow make clots more likely to form? It allows platelets more time in contact with endothelium. 74. What can cause venous stasis? Inactivity, CHF, varicose veins, and thrombophlebitis. 75. What are some hypercoagulation disorders? Oral contraceptives, polycythemia, and multiple myeloma. 76. What are some symptoms of a pulmonary embolism? Shortness of breath, tachypnea, weak pulse, lightheaded, anxiety, sweating, cyanosis, cool or clammy skin, chest pain, cough, bloody sputum, wheezing, and leg swelling. 77. How does an x-ray help to diagnose a pulmonary embolism? It is often normal but can be used to rule out conditions with the same symptoms. 78. What is the first line test for diagnosis of pulmonary embolism? 79. What might you see on an ECG for a patient with a possible PE? Non-specific ST-T wave changes or A-fib or A-flutter. 80. What does a D-dimer test look for and what is considered positive results? Tests for protein fibrinogen and values higher than 500 ng/mL are positive. 81. What test is used to differentiate between blood and clots? 82. What is the result of venous admixture developing in pulmonary embolism? Bronchial smooth muscle constriction (shunt-like effect). 83. What is often the effect of pulmonary embolism on venous admixture? 84. What is one symptom of pulmonary embolism? 85. What is observed in patients with a PE? Distended neck veins and swollen and tender liver are often observed due to PE. 86. What is abnormal about heart sounds with PE patients? Increased S2 due to the valve closing more forcefully, increased splitting of S2 and a third heart sound. 87. What portion of the heart works harder when there is an increased pressure of the lungs? The right ventricle is overworked. 88. What is the most common abnormal ECG pattern that may suggest the possibility of a PE? 89. What are some possible x-ray findings in a patient with a PE? Increased density, hyper radiolucency distal to embolus, dilation of pulmonary arteries, pulmonary edema, cor pulmonale and pleural effusion. 90. What diagnostic procedure uses a radioactive compound that is inhaled into the lungs? 92. What is the name of a slow-acting, oral anticoagulant that can be taken preventatively at home? 93. What do thrombolytic agents do? 94. What are some thrombolytic agents that dissolve clots? Streptokinase, urokinase, alteplase, and reteplase. 95. What are some preventative measures that can be taken to avoid a PE? Walking seated exercise, drink fluids, compression stockings, vein filter and pneumatic compression. 96. What is a pulmonary embolectomy? The surgical removal of clots. So there you have it. 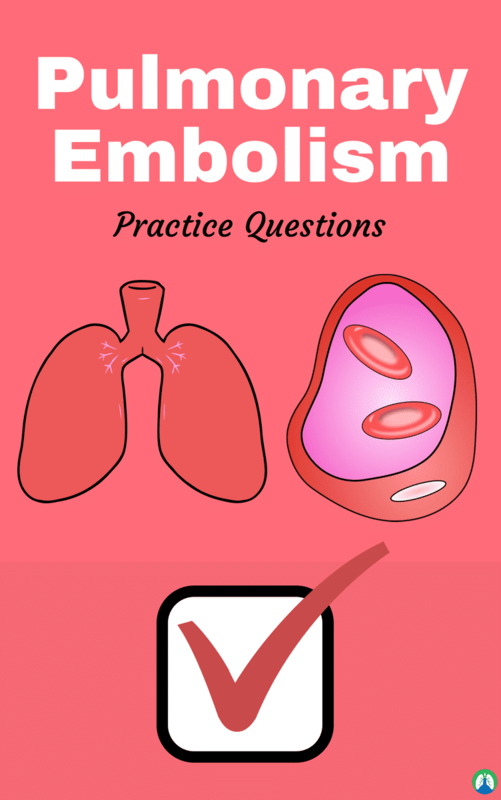 I hope these pulmonary embolism practice questions were helpful for you, and I hope this study guide can help you learn what you need to know in order to be successful in Respiratory Therapy school. If you use it properly, I know it can. Thanks for reading and as alway, breathe easy my friend.